The August 2009 Daring Bakers' challenge was hosted by Angela of A Spoonfulof Sugar and Lorraine of Not Quite Nigella. 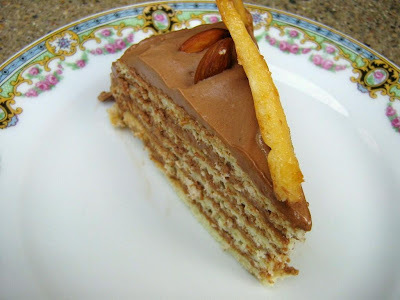 They chose the spectacular Dobos Torte based on a recipe from Rick Rodgers' cookbook Kaffeehaus: ExquisiteDesserts from the Classic Caffés of Vienna, Budapest, and Prague. These ladies chose a dessert that puts the word 'challenge' into the Daring Bakers title. But their choice was also extremely fun for just that reason. :) Please visit their blogs. They both have wonderful talent and their writing/photos will inspire you to keep on baking! The first thing that went through my head when I saw the challenge would have required censorship had it been a live broadcast. As an amateur baker, this was quite daunting at first glace. I am by no means lazy when it comes to baking, I love spending all day at the helm of my oven and stove. But even for me this sounded incredibly labor intensive. However, I did not allow my neurotic tendency to over think situations deter me from attempting this torte. I actually read through the recipe several times. I'm terrible at reading through recipes. Normally I just plunge head first into things and dodge any mishaps as they come like a sleek ninja during a dagger attack. I do this so I won't psych myself out before even trying something. With this recipe though, reading through it actually made it less intimidating. It really was not as difficult as I had initially thought! As far as taste is concerned, this was not my favourite dessert. It would have been much better had I used dark chocolate for the buttercream frosting. I was too into the baking process to stop and run to the grocery store so I made do with semi-sweet. The cake was similar to a very thin sponge cake. I zested a lemon which made it a little bit less sweet. I did like the sensation of eating the layers. I'm a sucker for a great texture and it was a nice balance between cake and frosting. This would be the perfect dessert for a special birthday or anniversary! Beat egg yolks with sugar about 15 minutes, or until lemon colored. Gradually fold sifted flour into the egg yolk and sugar mixture. Beat egg whites until stiff, but not too dry. Fold egg whites into the egg yolk and flour mixture. Cut several pieces of parchment paper to line baking sheets. Working with three sheets at a time allows you to rotate them while spreading, baking, and cooling. Draw a 9 inch circle on each piece of parchment (a cake pan makes a great template). Flip the parchment over (ink/pencil side down but visible) and place on a baking sheet. Spread batter evenly within the circle, about ¼” thick per layer. Bake in moderate oven, 375 degrees F, about 8 minutes, the sponge cake should spring back when gently pressed and edges are brown. Invert the cake and gently peel off the paper, place on wax paper until completely cooled. Repeat until all the batter has been used. Be sure the baking sheet has cooled prior to re-using. Set the best looking layer aside for the top. Cut this layer into serving pieces. Place pieces on a wire rack set over foil. Note: you may want to reserve two layers in case of trouble with the caramel topping. In double boiler melt chocolate with a little water. Add sugar, vanilla and beaten eggs. Stir constantly until it thickens. Remove from heat, let cool. Mix ½ lb butter with Powdered Sugar. Add to cooled chocolate, mix well. Add more powdered sugar if needed. Spread the chocolate filling between each layer and on sides of cake (save some filling to pipe around top but do not spread on layer reserved for the caramel top). Put sugar in saucepan on medium high heat. Melt until brown (use a light colored saucepan to better see the color of the sugar). Do not overheat. Remove from heat and pour over top layer that has been cut and set on rack over foil (see above). Spread with a buttered knife if needed. Work quickly! This will harden very fast. When caramel has cooled, place the caramel topped pieces carefully on top of frosted layers. Pipe the edges with reserved frosting. Lovely torte! I love your ninja analogy -- HA I can be like that, too! I'm trying to make myself read through recipes more thoroughly after several mid-recipe grocery runs (sigh). I also know exactly what you mean about being tense every step of the way -- this was definitely a challenge! You did fantastic, though! Gorgeous!! Your torta looks stunning =D. I love your writing style! now that you mention it, yes the layers did add quite the texture. for an "amateur baker", this cake looks fab. great job! Hi Angry Asian. Again, I love the name. :) Thanks for the comment. My camera can be very forgiving If she is in a good mood and doesn't mess around with the lighting. You did a great job on your challenge!! Beautiful torte!!! You're so right about the texture. And I bet the lemon was a great addition! 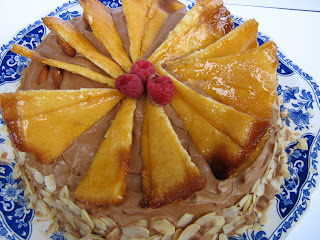 What a beautiful Dobos Torte! Love your caramel glaze - I failed mine! Thanks CookiePie. I think I could put lemon zest/juice in just about everything. Your labor of love has turned into a very impressive masterpiece. I doubt I could do as beautiful a job as you did. This also looks incredibly delicious. A beautiful Torte! Very well done! 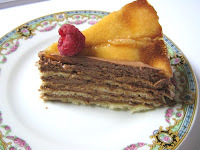 your Dobos torte looks lovely. Ooh Valerina! The torte looks delicious! 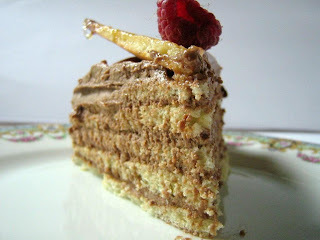 I can only imagine how good it must have tasted :) Your caramel layer looks good too! 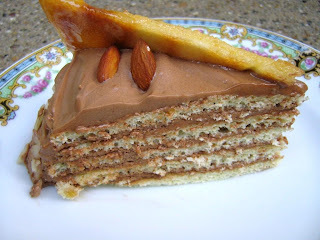 Hello Valerina, It's the first time that I write in your Blog and tell that you have very good recipes and your Dobos Torte looks delicious!! The photos are fantastci. Now I'm a new fan yours.